I’d normally expect to get an older and slightly mis-treated courtesy bike when taking my Honda CB600F Hornet in for an MOT. 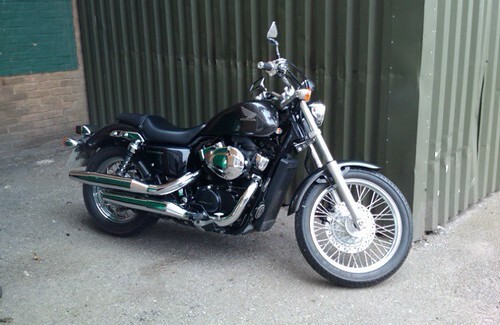 recently though, I was pleasantly surprised by Hartgate Motorcycles when they gave me this Honda Shadow VT750C demo model whilst mine was being prepared for the next 12 months road worthyness! It’s a “custom”, as Honda calls it, and with only 750 miles on the clock I was pretty shocked they allowed me to jump straight on. But what the hell, I’m not going to complain. It starts at around £6,925 and after some customisation would probably come to a little bit more! The riding experience is completely different. The Honda Hornet I’m used to may be made by the same company, but they are as different as chalk and cheese. The Hornet is more upright with a responsive throttle on the inline-four. It’s fairly quiet, in part due to the 599cc engine and four cylinders. It also allows for quick accelleration and braking. The Honda Shadow VT750C is a745cc V-twin. The engine sounds louder, and the throttle is much less reponsive – but not in a bad way. The overall differences led to a different riding approach. The Shadow made me ease into and out of situations, taking more time and enjoying more about the experience of riding. I had a more relaxed riding position which was lower, which helped me feel lower to the ground and closer to the road. The Shadow is definitely louder, heavier (262kg vs. 185kg ish), smoother and definitely more of a head turner. It’s increddibly fun and exhilerating. The Shadow embodies everything that motorcycling is and should be about. But, it’s less practical in my daily commute and it’s weight takes a little bit of getting used to. Other than that, i’m running out of excuses not to swap. But the Hornet will live on for a while yet! !